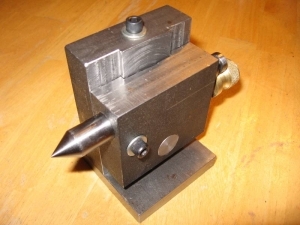 Homemade adjustable tailstock capable of utilization with either a spin indexer or a dividing head. Rod was fabricated from 5/8" W1 tool steel and features a 60-degree center point. Brass nut enables 1" of horizontal adjustment.